Celebrate a special spot on the map with this coaster customized with your coordinates of choice. Home is where you hang your hat. It's also where you keep your favorite Cab uncorked. Celebrate a special spot on the map, and protect your table from wine stains, with this bottle coaster customized with your coordinates of choice. 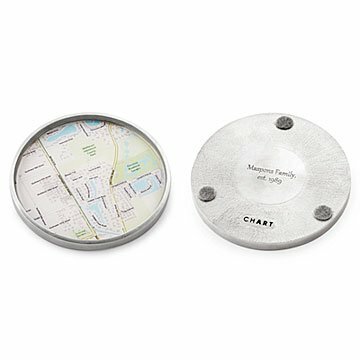 Each map or chart swatch is displayed in resin and mounted in satin-finished, lead-free pewter, which will take on a warm patina over time. The functional way to show your hometown—and home bar—pride makes a creatively personalized housewarming gift. Handmade by Charlotte Guptill in Portland, Maine. Add extra personalization with a custom message engraved on the back of your bottle coaster (up to 25 characters). International locations are available, but maps may be less detailed. Designed to patina slowly and evenly. If desired, apply and rub a mild detergent on pewter surface, rinse under running water and gently wipe dry with a soft cloth.